Warning that the European Union (EU) must not be turned into a “modern age empire”, Mr. Orbán defended the nation state and insisted the continent should hold on to its Christian roots. “People who love their freedom must save Brussels from Sovietisation, from people who want to tell us who we should live with in our countries,” the Prime Minister told the crowd gathered in Budapest. 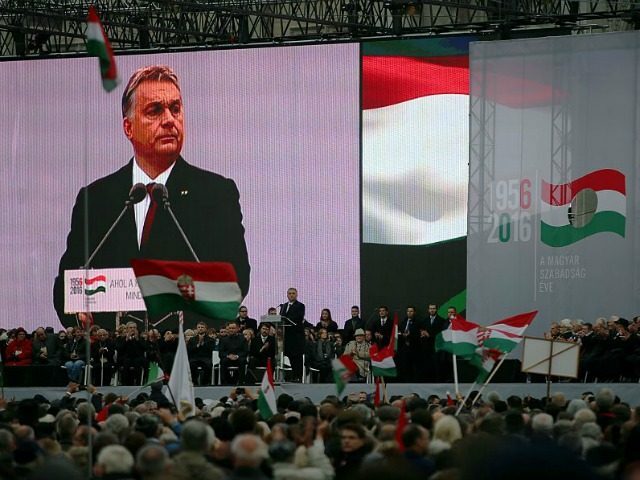 “It is only our national independence that can save us from being devoured by an empire,” Mr Orbán said, asserting that it was the “national idea” of Hungarian identity that prevented the country from being devoured by the Soviet Union. The Prime Minister told the audience that, as the heirs of the freedom fighters of 1956, Hungarians “cannot let Europe cut the roots that made it great and also helped us survive communist oppression”. He added that it’s impossible for Europe to be “free, strong, and respectable” if it lacks “the revitalising power of nations and two thousand years of Christian wisdom”. Referring to his Fidesz government’s policies, Mr. Orbán said Hungary had taken “the hard way” in “prefer[ring] children of its own to immigrants, work to speculation, earning a living to becoming a slave of indebtedness, and protecting borders to surrendering”. Harking back to the events of 1956 and commending Hungarians for their “talent for freedom”, the Prime Minister defended his tough stance on mass migration and promised the country can be counted on to do the right thing for Europe. “We must close the border to stop the mass migration that flows from the south”, Mr. Orbán maintained, telling the crowd that Hungary will stand tall “even if those whom we are trying to protect attack us from behind”. Lauding his countrymen for having “the courage to face injustice”, Mr. Orbán declared that “Europe can always rely on us”. Guest of honour at the event, Polish President Andrzej Duda reaffirmed his country’s commitment to support its neighbour’s opposition to mass migration and the migrant quotas Brussels wants to impose on nations across Europe. “You can count on Poland, we march together in the toughest moments…two countries which were built on Christian foundations and are now free in the unified Europe”, he said in front of the crowd in Kossath Square, who waved Hungarian and Polish flags. Other countries are rather less happy about Hungary’s resistance to mass immigration. U.S. officials stayed away from commemorations in what was “a very conscious, very clear decision” according to Andras Simonyi, a former Hungarian ambassador to NATO. “It sends a stark message of displeasure and serious concern with the state of democracy in Hungary,” Mr. Simonyi said. Last month Luxembourg’s foreign minister Jean Asselborn called for the EU to expel Hungary from the bloc, condemning the nation’s decision to “build fences against refugees from war”.